Indian television maker, Videocon has now joined with the world tech giant, Microsoft to manufacture World’s first Windows 10 enabled television. Videocon will be launching two variants of the television, one sports 32-inch model and another comes with 40-inched screen. The smart TV market is flooded with Android TVs, WebOS TVs and Tizen TVs. It is obvious that the entry of Windows TV will definitely make an iconic effect to this smart TV market. Microsoft joined in hands with Videocon as a part of its Waas(Windows as a Service) initiative. Videocon explained that this smart TV can be used as personal computer. 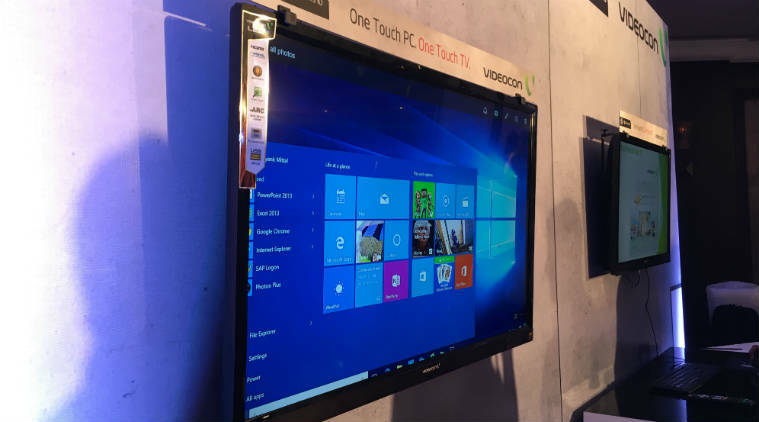 This device will be called as One Touch TV and will be introduced by pre-installing Microsoft Office, Windows Store and other fundamental applications. But still the folks are double minded about the full-fledged operation of this TV with Windows 10 loaded in it. All doubt the preciseness of the device when it comes to computer related processes and workings.In the present situation if anyone wants to convert their TV to a personal computer, then he may have to depend on Windows PC stick. Then only the device can be used as a full-fledged Windows device. Videocon instead of using the Windows 10 stick, seems to embed Windows 10 as an in-built feature. But the company hasn’t revealed the processor details or RAM of the device. We barely know about its hardware specifications. Windows 10 TV sports usual hardware features just like several other devices in the similar class does. The connectivity to the device can be established with the help of 4 HDMI ports, 3 USB ports, VGA and normal Audio input/output ports. Videocon also embedded a special feature by which the user can manually switch between TV mode and Windows 10 mode by simply tapping on a button. Videocon will be launching two variants. One will be with 32 incheddisplay and is tagged at $615 and another variant will be 40 inches which will cost you $815. Videocon is planning to achieve atleast 5% increase in sales with the introduction of new devices. They are also planning to launch more TVs loaded with Windows 10 and with high end specifications after looking on the response from the market. Videocon will be marketing this device with their existing marketing channels. The users need not worry about the after sale services, since the company promised that after sale services will be initiated through their present network.